During class sessions, students worked in small groups to create shapes, buildings, parks, and traffic jams, using only their bodies. This movement exercise encouraged students to determine how to portray images in such a way that would be immediately recognizable to an audience. In addition to enhancing their spatial awareness and communication skills, fourth graders developed physical, vocal, characterization acting skills. In their final production, students portrayed, through movement, one day’s chronological activities, from brushing one’s teeth to riding the subway to admiring NYC’s skyscrapers. On stage, students depicted the work and social lives of everyday New Yorkers including businessmen, construction workers, and dancers. Their collaboration skills shone through as they thoughtfully moved about the stage in multiple groups, especially when portraying the hustle and bustle of commuter rush hour. Given their enthusiastic performance, it was clear that PS 217 fourth graders have a firm grasp in performance, teamwork and have unique viewpoints on life in the Big Apple! While the fourth graders were engrossed in performing, second grade students were immersed in creating visual art. These students, led by teaching artist Abigail Weg, also focused on the landscape of New York City, particularly its buildings and skyline. They gained a foundation in a variety of visual arts media including stamp printing, drawing, collage, and watercolor. For many participating students, this was their first time working with many of the art materials provided, including printing ink and watercolors. Students used these materials to explore artistic concepts of form, line, pattern, and texture. 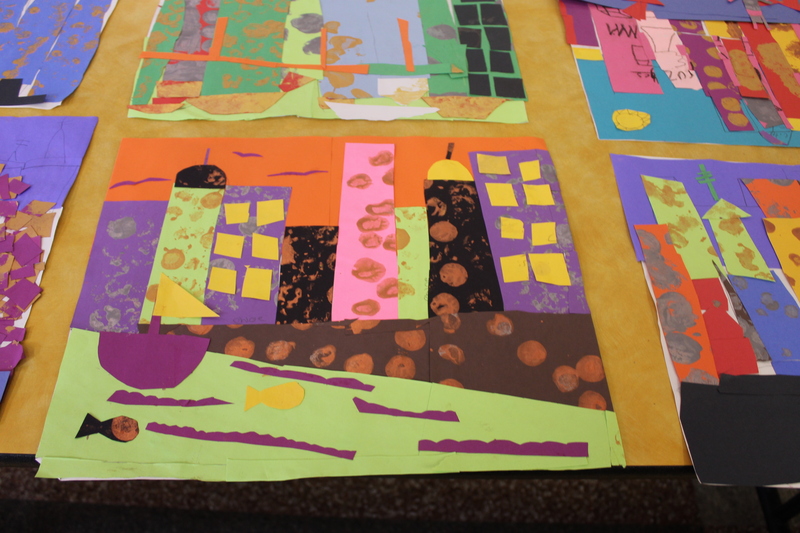 One of second grade’s most captivating projects was collage cityscapes. Final artworks included imagery of skyscrapers, bridges and fish that live in NYC’s rivers. Through use of overlap and layering of construction paper, students learned the concept of foreground and background; they also explored techniques in how artists visually depict these concepts. As part of art class, students took part in weekly small group discussions and class critiques during which they practiced speaking clearly to communicate their ideas. For example, students looked closely at scenic paintings of NYC; they shared observations about the imagery and techniques used in the paintings plus shared their interpretation of the imagery. Students also discussed specific art mediums they used, such as watercolor, and relayed proper technique for using the medium; one student even declared he enjoyed using watercolor most because “it brings the picture to life.” Like their fourth grade peers, these second graders learned quite a lot this summer. We’re thankful to FDC and the committed TAs, who have enabled the students of PS 217 to explore, in depth, their city through art.